MELDING Ghanaian rhythm, minimalist repetition and improvisatory jazz pizazz, percussionist Bex Burch unveils a debut album which glints with hypnotic majesty, all based around first-hand experience of living and making music with the Dagaare tribe of West Africa. Returning to the UK, Burch decided to develop the richness of the Gyil music she had come to be a part of by forming a band – appropriately named Vula Viel – with some of London’s most progressive jazz and improvisational musicians; the beat-driven line-up consisting of saxophonist George Crowley, keyboardist Dan Nicholls, drummers Dave de Rose and Simon Roth, plus vibraphonist Stephen Burke (and Jim Hart guesting). Under Bex Burch’s direction, her colleagues rehearsed/gigged hard to understand the rhythms and melodies of the Dagaare tradition, respectfully reinterpreting them into this exciting, contemporary, groove-laden experience. The successful cross-pollination of cultural creativity and instrumentation is what immediately grabs the attention – Nicholls’ electronic atmospheres and Crowley’s jazz-sax sensibility fusing organically with infectious world rhythms which glow to the leader’s bright, xylophonic timbres. Burch studied Steve Reich, and that mesmeric influence (also suggesting Terry Riley, Pierre Moerlen and even Ibiza-like sundown moods amongst its earthy, rustic charm) can clearly be identified in tracks such as Gandayina and Bewa which, with superbly echoic textures of Rhodes and synth, also become redolent of Soft Machine’s Six period. The dance element is key, as Zine Dondone Zine Daa rasps to the physicality of the Gyil, enhanced by sympathetic vibes and electronics (often the lines of definition are wonderfully blurred!) – and resounding to Crowley’s characteristically unfettered tenor, it all builds into magnificent, saturated, Nik Bärtsch-style complexity. There are moments of becalming beauty, too, across these seven tracks, often moving from watery, South African-tinted sunshine to Gamelanese delicacy – all displaying a constantly shifting undercurrent of invention. Vula Viel’s appearance at this year’s Ronnie Scott’s London Jazz Festival launch confirmed an enthusiastic response to their fizzing, live presence; and this studio account, listening closely to exquisite detail, provides its own thrill. It would seem that there are areas of this vast, African-inspired canvas yet to be coloured – and with such an intuitive personnel, that’s something to very much look forward to. 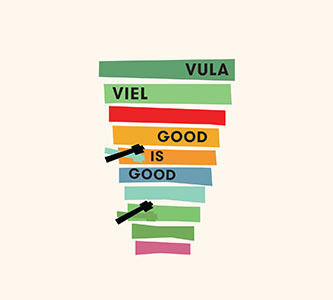 Released on 23 October 2015, Good is Good can be heard at and purchased from Bandcamp. Saxophonist/composer Phil Meadows already has quite a pedigree (NYJO lead alto, performances at the BBC Proms and Ronnie Scott’s, collaborations with Tim Garland, Jason Yarde, and so on), and now focuses on realising his own material with a first-class team of musicians – Laura Jurd (trumpet), Elliot Galvin (piano and Fender Rhodes), Conor Chaplin (upright and electric bass) and Simon Roth (drums). What sets this fine programme of seven new compositions apart, for me, can be defined as originality, multiformity and ambition. There is a oneness amongst these musicians, a great understanding between them which manifests itself both in the differing, tightly-scored sections of their output and in the dauntless improvisation this quintet is prepared to risk… and win! Opener ‘Fin’ immediately grabs the attention with an audacious alto fanfare from Meadows, leading straight to a catchy groove in which he and Laura Jurd instantly demonstrate their impressive close-mindedness. Elliot Galvin begins to show his uninhibited approach to piano, soloing imaginatively and sparkily – a joy to hear. ‘Moving On’ is a slick number, with both horn players in parallel as well as exhibiting their obvious solo talents. Changing tack with a more electronic approach, ‘Runner’ (a swipe at the frustrations of the South Circular’s regular gridlock) sees Chaplin, Roth and Galvin establish a funky groove resembling some Stanley Clarke / Billy Cobham / Mike Ratledge dream team! And, over this retro electric bass and Rhodes fusion (with Roth putting in some great hard-hitting percussion), Meadows and Jurd produce a sparkling display of soloing and interplay. I could listen for hours to discover where they take this! 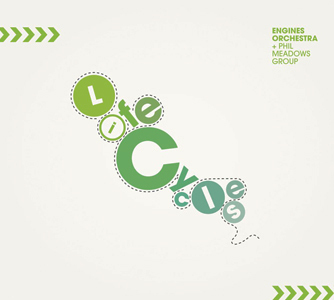 Title track ‘Engines of Creation’, paying homage to those who inspired this recording, initially deceives with its straightforward opening, only to disintegrate into wonderful piano and drums freefall (complete with breaking glass?)! But somehow, amongst this abandon, I still perceive a connectivity which eventually slides back into a stronger quintet finish. 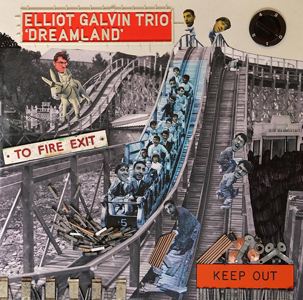 ‘Flamingos’ showcases Elliot Galvin’s pianistic brilliance with explorations inside the piano as well as some delightful, adventurous keys work; and Meadows and Jurd combine to build the piece into certain triumphal grandeur. Taking its motivation from Phil Meadows’ experience of a less-than-willing pub landlord, ‘Dragon of George’ again picks up the more jazz/rock approach with an exciting and complex rhythmical drive, led pulsatingly by Chaplin on electric bass. Galvin again gives his all, encouraging soprano sax and trumpet to join in the ‘angst’! It’s infectious stuff which, I suspect, might well be a live showstopper. ‘Captain Kirk’, with dainty piano and bass opening, develops into a satisfying ‘curtain call’ for the whole band, Meadows and Jurd again soloing fluently above a confident piano, bass and drums backdrop. 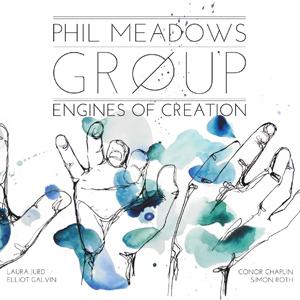 The Phil Meadows Group (supported by Jazz Services) has recently toured this new release, with more gigs anticipated soon, including 29 September at The Vortex. I hope Phil and this band enjoy a long future together, as here is a quintet which most definitely shows great enthusiasm and desire to ‘push the envelope’ with contemporary jazz. Splendidly produced by new UK independent label and collective, Boom Better Records.